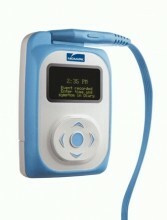 The IQholter recorder is small and lightweight, making it easy and comfortable for your patient to wear. The readable, well-lit display and intuitive keypad make clinician navigation and menu control simple. Click the button below to add the Midmark IQholter EX Digital Holter to your wish list.